The understanding that a successful content marketing plan can truly make or break your business isn’t a new concept. 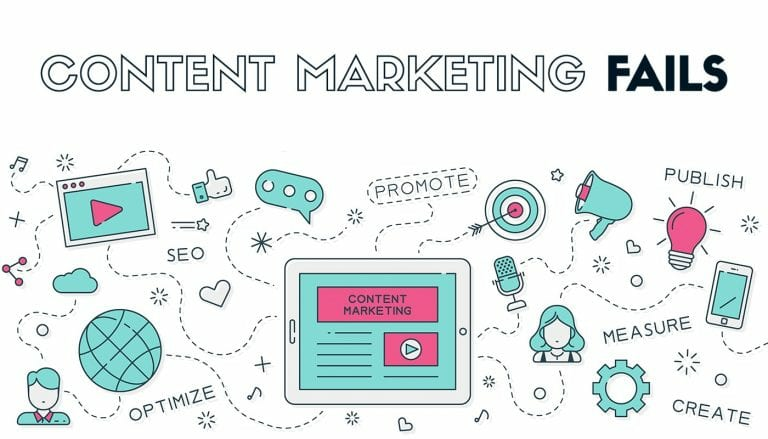 Effective content marketing can help boost brand awareness, acquire more leads, and even drive sales. But with only roughly 25% of B2B and B2C marketers reporting they’re extremely or very successful with their overall approach to content marketing, there’s clearly a disconnect when it comes to correctly executing this tactic. To help avoid receiving less-than-stellar results, avoid these five content marketing fails and learn how you can fix them below. Are You Making These Content Marketing Fails? From, the “less is best,” belief to not-so-good content marketing calendars, we’re tackling the most common content marketing fails and myths so you can ensure your content is excellent every time. It’s easy to fall for the belief that the more content your brand produces, the better your brand looks and consequently, the less time you need to spend on promotions. However, when it comes to content, it’s best to focus on quality rather than quantity. A good piece of content takes lots of time to produce. After all the planning, writing, editing, and last-minute tweaks, why wouldn’t you go the extra mile to show off your hard work? FIX IT: While not every blog you write is going to be groundbreaking, it’s important to recognize which pieces of content are worth more effort. One place to start is to promote your most popular or best-performing pieces often on all your platforms. Send out your great work through an email, tweet, Facebook post, or make it stand out on your website. You can even back your work up with some advertising dollars to really make your results soar. On the same note as missed promotional opportunities, one of the most self-destructive content marketing fails is limiting your content to one form. For example, it’s not uncommon to think a blog post or article is a static piece of content. At first glance, a few paragraphs obviously don’t resemble a YouTube video or an infographic—but that doesn’t mean they can’t with a little hard work. Once you’ve repurposed your original content, you can reach your audience with “new” content, extending the life and value of your original piece. This content marketing fail is an easy to trap to fall into. While your intentions of producing timely content are great, this can lead to a hectic writing schedule. There are bound to be times when you’re fighting to be heard in an overcrowded trend and searching for content when there’s seemingly nothing to report. FIX IT: Create a content calendar that spans out no longer than three months. A content calendar will help you plan for what you want to write about and when, so you aren’t scrambling for a story when writers’ block hits. Sticking to a three-month span will ensure your content is both timely and give you a solid “Plan B” that you’re sure is reliable. When it comes to your business, it’s common to think everything you produce should be about your business. To help understand this fail, imagine your brand is a person. Someone who only talks about themselves can come across as repetitive, annoying, and even selfish. To avoid sounding like a broken record, aim for a more balanced content plan. FIX IT: Instead of producing content that is 100% about your business, opt for the “Rule of Thirds.” Putting out content that is roughly 1/3 self-promotional, 1/3 industry-focused, and 1/3 interaction-based will help guide you to content marketing success. Instead of appearing one-sided, you’ll be producing and sharing content that not only appeals to and entertains your audience, but is good for your brand overall, too. The success of your content marketing isn’t as black and white as your other business efforts, but that doesn’t mean it isn’t trackable. Depending on your specific goals as a brand, there are lots of ways to see where your content marketing efforts are getting you. Rather than skipping content marketing because you don’t immediately see results, take some time to analyze your business and decide how you ideally want your content to serve you. To take monitoring a step further, consider enlisting the help of a service such as Google Analytics for a complete breakdown of your websites, traffic, and audience behavior. With this much data, you’ll see how your content marketing efforts are translating and hopefully resulting in a healthy return on investment (ROI). Does your content marketing plan still need some fine-tuning? The Front Porch Solutions team is here to help take your content marketing to the next level! Contact us today to discuss how we can help create a successful plan for your business.